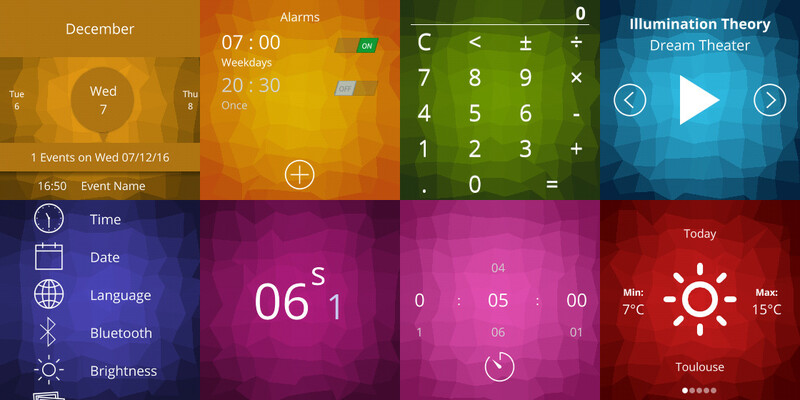 AsteroidOS is an open-source operating system for smartwatches on which I’ve been working for the past two years. Today, I’m delighted to announce the availability of the first alpha release of AsteroidOS for four different devices. A smartwatch is a connected device that can get access to a wide range of personal information. Many users believe that the current proprietary platforms can not guarantee a satisfactory level of control over their privacy and hardware. Hence, I noticed a need for an open wearable platform and AsteroidOS is my attempt to address this issue. Pushing AsteroidOS from an idea to a proof of concept and then eventually to a viable system has been an incredible journey full of encounters and a beautiful story to share. This project brought me the chance to be a speaker at diverse conferences and to meet so many friends. In the year 2016 only, I spoke at FOSDEM in Brussels, QtCon in Berlin, Open Source Summit in Paris, Capitole du Libre in Toulouse, Embedded Linux Meetups, C++/Qt workshops and also specialized meetups around AsteroidOS in London and Berlin. Each and every one of these events was an opportunity to exchange ideas with community members which is invaluable to me. Despite its early status and lack of official releases so far, AsteroidOS has also benefited from a broad mediatic coverage with articles and interviews in countless websites and magazines (PCWorld, xda-dev, YCombinator, Linux Users etc…). It’s always a very pleasing experience to discover articles about AsteroidOS. More recently, I’ve also been working with Jolla on a demonstration of their Sailfish technologies running on top of AsteroidOS. This has been a very interesting collaboration on both technical and community levels and I’m deeply interested in strengthening the links between our projects. On a purely technical side, my main goals for the platform are: expanding battery life beyond its current limitations and supporting more sensors. These two aspects are very important in the success of a smartwatch OS and also exciting technical challenges to work on. Until now, they have been volontarily left apart in favor of more fundamental tasks. I’m also looking forward to collaborating with more companies interested in using AsteroidOS technologies in demos or products and can be contacted at any time. Community is an important part of this project, therefore I would like to give special thanks to various members for their valuable contributions. If you want to join the community, check out the Get Involved page of the AsteroidOS website.